Choose from Baby Shower Favor Boxes, gable gift boxes, take-out boxes, popcorn boxes and more, for your favor goodies, that your guests will be delighted to take home. Box up your favorite treat, whether it's chocolates or jelly beans ... or, flower seeds or bath beads ... give baby shower favor boxes full of goodies in appreciation to all of your guests. Tip: Think "simple" for your favors. You'll be assembling many boxes and you want to be sure all the goodies you select will make a nice presentation to your guests. Learn How To Assemble A Baby Shower Favor Box below on this page. A Chinese take-out box or Mama's "ready to pop" popcorn box make excellent choices for themed baby showers. For elegant, Asian or even sports/movie themed showers. Favor boxes with polka dots or linen texture for your baby shower are pretty to gift and easy to assemble. Tie with a coordinating bow in organza or satin ribbon. Choose an embossed or sleek pinstripe favor box for an old world elegant look. And acrylic favor boxes will be a keepsake for your guests. Fill with your favorite baby shower candy, mini cupcake or cookies. Lots of amazing choices to package your baby shower favors. Find the one best suited to your theme. Having a religious baby shower theme? These personalized cross tins are perfect. Create special favors for those very special guests! Adorable Baby Block favor boxes for all of those delicious goodies, from A to Z! The favor box is a paper baby block box with 2 clear acetate windows. 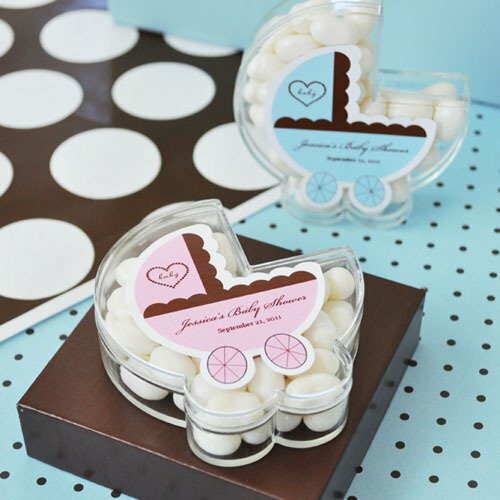 Baby shower candy is perfect for these favor boxes. Looking For Baby Shower Favor Bags? thanks to your guests. 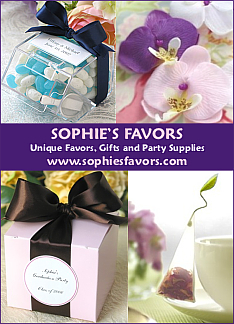 Choose from many styles, including popular organza favor bags! Tie perfect gift bows for your baby shower favors in seconds!